Many of you know that I am an avid (some might say obsessed) reader, and I always love the opportunity to meet the authors of books I am reading. 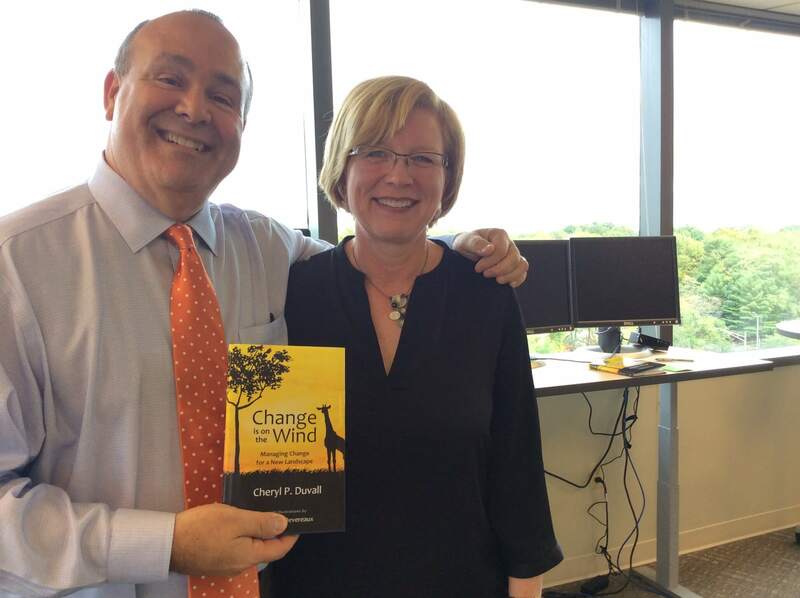 Meet Cheryl Duvall, author of the just released book, Change is on the Wind: Managing Change for a New Landscape, who stopped by our new offices and signed my book. Cheryl and her husband, Dudley Whitney, led the design and change leadership process we used for our new, open, collaborative offices as we make the “shift change” at MACPA / BLI. She got to see the result of her work and our change process in our move to a smaller-footprint open space. Loss of enclosed personal space. Reduced size of individual spaces. Loss of permanent habitats for some residents. Far more open and transparent landscape. This “guiding coalition” of the senior management then develops a change leadership plan based on John Kotter’s eight-step change model, along with a vision and strategy around the move. The book follows the ups and downs of the change process as the animals prepare their kingdom for the move. The story relates well to many of the real-life situations that occur with any major organizational change, including resistance, rumors, and all of traits of people along the adoption curve. The lion king empowers his group, the guiding coalition, to come up with a vision and strategy for how they will make this major change and preserve and strengthen their culture. The book takes you on the journey as the group develops a case for change management, develops the vision and strategy for the move, and creates a change agent committee and a pilot project to make the change easier. Cheryl’s visit came right after our full team meeting, where our “culture club” (the equivalent of the change agent committee in Cheryl’s book) conducted an anonymous survey of our first two weeks in the new space. The results and feedback were extremely positive, with 96 percent of our team answering that they had already experienced “easier collaboration and learning” and 83 percent feeling productive in the new space. While these results are terrific, it has not been without challenges, yet leading the change process makes it much easier and, more importantly, strengthens your culture at the same time. While the major part of the story is an office move, the change process applies to any large-scale change initiative and serves as a handy handbook to guide you through the process. With change management / leadership showing up as one of the most sought-after skills, this book is a great start. I highly recommend it and want to thank Cheryl and Dudley for helping us move to new lands at MACPA / BLI. And I wonder why Whitney the Wildebeest seemed so familiar to me? This is the second dispatch from our experience making the shift change. Our first post, MACPA is making the shift change – today! outlines our three objectives in making the move to the cloud and our office space move.